Swarovski Crystal Pearls are perfect strung on their own or creates truly dramatic effects in combination with Swarovski Crystal Beads and components. 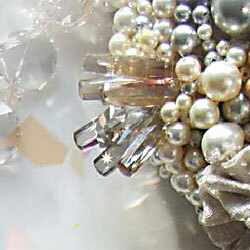 Swarovski Crystal Pearl technology is the enviable secret behind their Crystal Pearls. They are called Crystal Pearls because each is created around a crystal core. It is this crystal core that give these pearls their ideal weight: the high specific gravity of these imitation pearls made of crystal gives the Swarovski Crystal Pearls the same weight as cultured pearls. They also feel good to the touch and offer the special sensual experience valued by pearl lovers. With the innovative Swarovski Crystal Pearl technology, Swarovski Pearl coating is applied around the crystal core in flawless pearly layers. Not only does the crystal core give the pearl its ideal weight, but combined with its pearl coating, it cause the Crystal Pearl to glow from within. Swarovski updates ites Crystal Pearl colours and shapes twice a year - adding even more fantastic dimension to pure pearl and crystal combination creations.